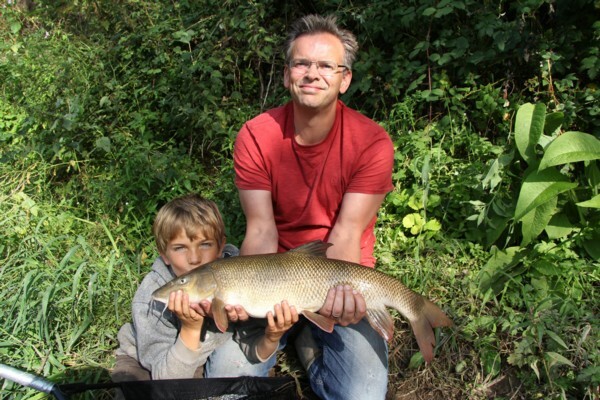 I had guided Richard last year on the river where he caught 32 barbel on another beat. I also had another day with him on this beat where he caught some good barbel to just under 8lbs. 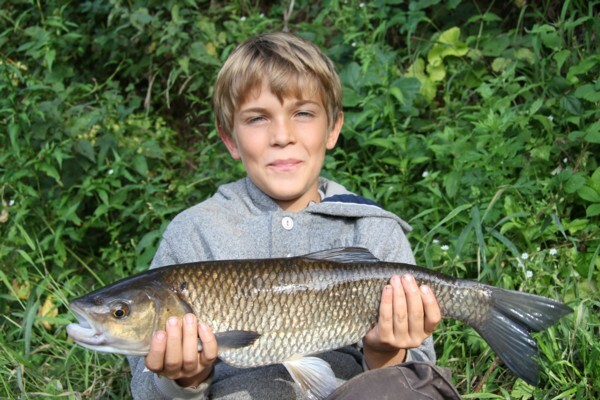 So earlier in the year he asked if I could guide him and his lad Dominic and see if we could catch Dom’s first barbel. Preparation were made for the August bank holiday week. The river had been the lowest I had seen it. There was a small pulse of rain that came through in mid August but that had passed through and the level was back down again. I met Richard and Dominic at 9am and soon we were fishing a 70g open cage feeder in the swim. Normally you need at least 90g here to hold bottom, however to be fair 60g would now do the trick. The end tackle was still the trusted curve shank size 12 with a 10mm pellet hanging off on a hair coupled with 2ft of ESP 12lb fast sink braid. Action came within the first 15 minutes with two chub the largest being 3lbs 6oz. It was warm and humid with plenty of canoes passing down the river. Sport slowed down during the morning and then at 12.45pm another chub came along. The barbel were very elusive. However at 1.15pm the 3 foot twitch came on the downstream rod and Dom was playing a much better fish which had him working really hard. It was just a normal run of the mill 6lb 9oz but really had Dom wondering what he had hooked. With his first barbel under his belt an hour later he was playing another one when for moment the fish got behind a stone and the braid parted. Then it was Richards turn on the rods. It didn’t take long before the rod really pulled around with that 3 ft twitch and an angry barbel was trying to put as much distance between it and Richard. It looked to be a large barbel and as we drew it over the net I thought perhaps 9lbs plus. However on the scales it went 8lbs 12oz and a new PB for Richard. Almost immediately after recasting the rod pulled around again and Dominic was playing another barbel this one though seemed to be smaller. On the scales it went 3lbs 8oz. Two more 3lb chub came along with the largest being 3lbs 11oz. 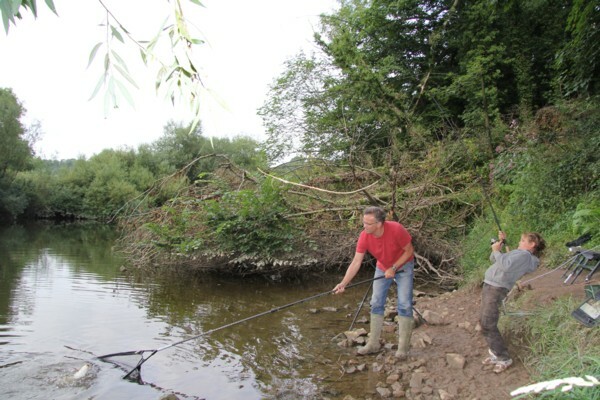 It was almost time for them to go back for dinner with the other family members when the rod arched over and another barbel become unstuck on a bolder. So the end result was 7 chub and 3 barbel with a couple lost. However pb’s for both anglers so it smiles all around. Breakfast at Richards and Dominic hotel didn’t get served until 8.30am so this resulted in a good early morning feeding spell being missed. So a plan was made to meet at 6.45am and see if we could catch a barbel before breakfast. Sure enough we met and by 6.50 a barbel of 5lbs 6oz graced the net so barbel before breakfast ticked the box. Then in the next hour another 2 more of similar size were landed and by 8.30am Richard and Dominic were heading back for a well deserved breakfast. One of the requests from Dom was to catch an eel as he had never seen one before. Now those of you that I’ve guided know that my love of eels is not what you would call high on my list. Most of the time I refuse to unhook the things. So when Richard and Dom returned we spent an hour searching the swim for barbel and finding no takers we moved to another swim where I had caught 4 eels in an hour during the summer. Tactics were similar however I had split the pellet in two so that the eel would be able to eat the pellet and therefore give a positive bite. Guess what within 10 minutes of casting out the rod rattled a few times and then pulled around. Dom took the rod and reeled in an eel of about 1lb. To be fait he had a go at unhooking it but the thing coiled around his hand and I think the slime was too much for him. Lucky for me the eel was lip hooked and with some forceps unhooking was very straight forward. We stayed on for another hour as Richard didn’t get a good photo of the eel. We had a few tentative pulls and then a good nod on one of the rods and a steady pull around. This time the fish fought quite hard and I thought a larger eel was the culprit. However soon in the clear water a good chub of about 3.5lbs was in the net. So with the eel box being ticked too we returned to the original swim. Don the owner came along for a chat and we were saying that today it seemed that only the barbel were feeding. However no sooner were the words out when the rod arched over and a 3lb chub went into the landing net. By this time Richards Wife and Daughter arrived for the last hour or so. Then we were forced to eat our words as chub after chub came along. They were good size fish too. 4lbs 4oz , 5lbs, 4lbs 9oz , 4lbs 8oz. The young Daughter Eva wanted to try and land a fish. So we set a timer on the phone for 10 minutes of fishing time left as they had a long journey home to make. As the minutes ticked by the rods remained still. The alarm sounded on the phone and it was time to leave. However one chub had a different idea as the rod pulled around. Eva was soon on the rod trying to reel the fighting chub in. She did exceptionally well and soon she posed with a 3lb 6oz. I think Richard has a photo of all the family holding this chub. 8 hands on one small chub was sight to see. So 7 chub to 5lbs and 4 barbel and of course that eel made for a good days sport. At 5.30 we said our good byes and wished them a safe journey home. I stayed for another couple of hours and caught 2 more small barbel. A couple of other angler turned up who were fishing the next day. They knew I guided a friend of theirs before on this stretch so I felt compelled to help them out too swim selection and tactics. I even let the young lad two chub the largest being 4lbs 10oz which was a pb for him. So once they had gone it was time for me to pack and return home. So 15 chub and barbel in total for the day was OK.
Richard if you have any more photo’s then please send them on and I will include. This entry was posted on Saturday, September 7th, 2013 at 5:24 pm	and is filed under Uncategorized. You can follow any responses to this entry through the RSS 2.0 feed. Both comments and pings are currently closed.